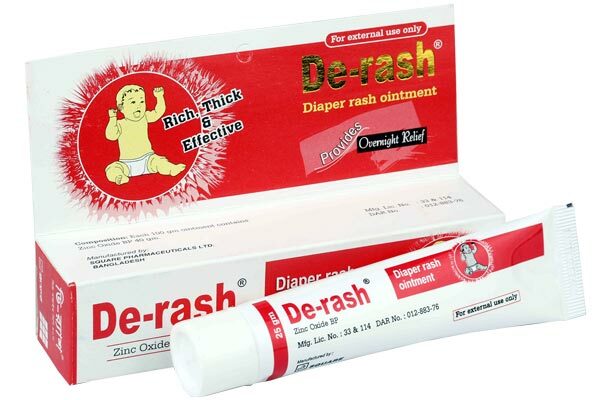 De-rash (Zinc Oxide) helps treat and prevent diaper rash while it moisturizes and nourishes the skin. The zinc oxide based formulation provides a protective barrier on the skin against the natural causes of irritation. De-rash (Zinc Oxide) spreads on smooth and wipes off the baby easily, without causing irritation to the affected area. Change wet and soiled diapers promptly, cleanse the diaper area, and allow drying. Apply ointment liberally as often as necessary, with each diaper change, especially at bedtime or anytime when exposure to wet diapers may be prolonged. De-rash® Ointment: Each pack has a tube containing 25gm of the ointment.